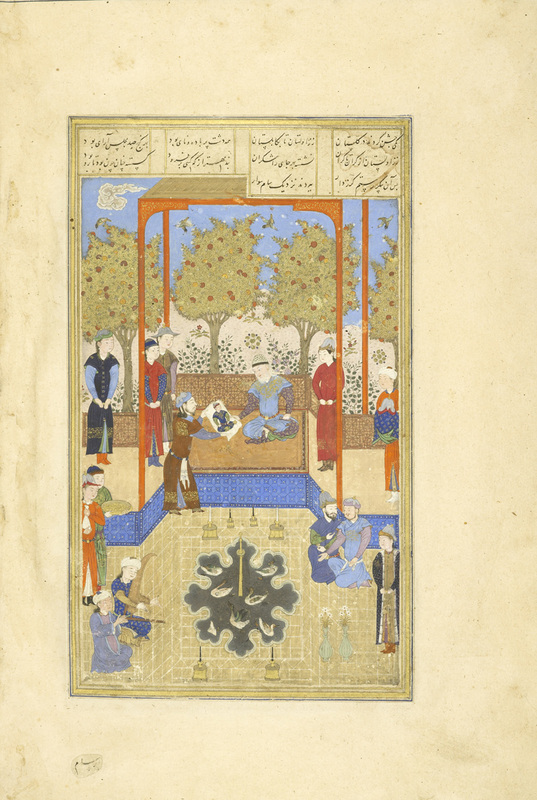 Sam, the Iranian ruler of Zabulistan, examines a likeness of his newborn grandson, Rustam. The infant is the impressive size of a one-year-old and Sam is delighted both by his size and his resemblance to himself. The man who presents the picture to Sam may in fact be the artist who painted the portrait of Rustam, not just a messenger; he leans forward eagerly and with confidence, but his downturned mouth hints at his anxiety in presenting his work for review. Illustrations of this scene are rare, and this painting gives us a privileged view of court life. The outdoor setting is spacious but not excessively grand. Zal sits on an elevated platform sheltered by a red baldachin, surrounded by attendants and courtiers. Fruit trees can be seen growing in the background. The trees bear both silver flowers and ripe oranges, which may have been intended to symbolize youth and maturity—a pairing that mirrors the relationship between Sam and Rustam.